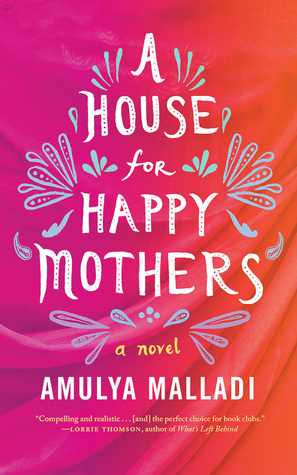 If you are looking for a good book club discussion book, I would definitely recommend A House for Happy Mothers. There were several times during the book where I found myself thinking about how I would react if I were Priya or Asha, and in my book club experience, those make the best questions for discussion. In any case, it was a great book for putting me in other women's shoes, and it helped me to see things from both of their perspectives. I found Priya to be a bit more relatable, almost certainly because our life experiences are more similar. While I was reading, I did find myself wondering how accurately the Indian surrogate house was portrayed. It wouldn't surprise me to find out that it was actually a view of a surrogate house through rose-tinted glasses though, and that's really sad. I was appalled at the way the doctor was manipulating Asha, clearly trying to get her to agree to be a surrogate again before she was even finished incubating the first one. And maybe it wouldn't have bothered me so much if Asha had been handling the pregnancy better emotionally, but the doctor showed such little care for the women in her care. It just made me so mad. Read my discussion questions here. I only participate in a young adult bookclub, which is from the school where I work and I'm one of the 'leaders'of the group. But, this book does sounds very interesting and very different from what I usual read. Sometimes we need those feel good stories.